My key to success in this whole thing can be summarized in two words. Meal planning. Meal planning is a great thing to implement even if you aren’t doing a paleo style diet. 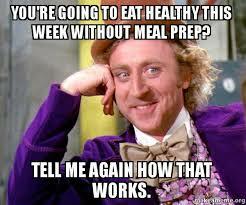 Meal planning can save you a buck or two, keep you from wasting food, and just overall help your sanity. I typically do my meal plan from Sunday-Saturday every week on Friday’s. I use a printed out weekly calendar, my Passion Planner, or a template from online. Each person is unique so you will have to find what works for you. Here is a good place to start. I do my grocery shopping on Saturday’s typically and then use Sunday as a day to cook. The first step to my meal plan is to write down any activities I have going on in the evenings, this will dictate what type of meal I need to plan for that day. For example, my daughter has gymnastics on Tuesday evenings, so I usually plan leftovers or a crock pot meal for that day so that dinner is ready whenever my husband and I get home separately. Then I usually start with dinners. I plan out each dinner and determine if there will be enough leftovers from each meal for lunches. If not, I plan to cook 2-3 things on Sunday so that I will have enough food for my lunches. It is a good idea to make your grocery list at the same time that you write down your meal plan. That way you can make sure you have the ingredients for each recipe, especially if you will be cooking a new recipe. Another helpful hint, is if you try a new recipe and like it, move it to a “Yummy” Pinterest board or keep a list handy of recipes you love. That way you can incorporate these into future meal plans. I have also used this service: Once a Month Meals. This is service that will give you a shopping list, prep list, cook day list for once a month cooking. All meals are cooked and then placed in the freezer and then can be thawed for easy cooking. Users are able to choose their meal plan type (ex: Paleo, Vegetarian, Kid-Friendly, Slow cooker, etc) and the the generator will give you recipes according to your chosen criteria. It is a subscribe type service though, so you must pay for it each month. If it interests you just put a note on your calendar to cancel it in one month and just pay for one month to try it out. It is really nice to have dinner ready in 10-15 minutes when you get home from a long day. After I have dinner and lunch figured out, I’m basically done. I typically eat the same thing for breakfast everyday, but if you need a little variety in your life, you can plan for breakfast as well. Here is my meal plan for the week of 7/26-8/1. Breakfasts: 3 eggs fried in coconut oil with chorizo/breakfast sausage link, and sauteed spinach or cabbage. Sunday-Pork chops (recipe below), steamed broccoli, fried zucchini, and applesauce. Monday: Paleo Tex-Mex Casserole and Tacos for the rest of the family. Wednesday: Paleo Sun-dried Tomato and Spinach Burgers and sweet potato fries. Thursday: Bacon wrapped chicken and whatever vegetables are going bad in the fridge. Place pork chops in a gallon zip lock bag in a bowl. Pour in 1 T of Apple Cider vinegar, 1T of salt, and cover with water. Let marinate over night. The next day, drain pork chops, rinse with water, pat dry. Coat each side with salt, pepper and paprika, cook in your favorite oil (coconut, olive, avacado, ghee) on each side until done. 🙂 Delicious. This entry was posted in Uncategorized and tagged meal plan, meal planning, paleo. Bookmark the permalink. Reblogged this on Formula For Fabulous. My life and grocery shopping has become so much easier and healthier since I started meal planning!! Thanks for following my blog!